First, let me say that this is not my original idea, but it is my design. Many beading books have examples of horizontal netting. I was inspired when I saw a netted amulet purse a friend made after taking a class from Diane Fitzgerald at Beautiful Beads. 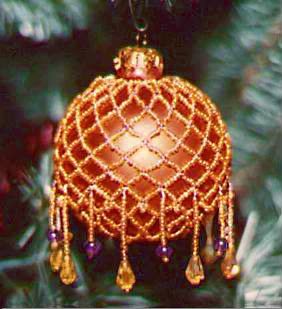 My friend, Doris Coghill, and I both decided to try beading around an ornament. We developed slightly different methods, but came up with similar results. I did, however, create the following set of directions and drawings and ask that you respect my copyright! If you'd like to use or print these directions for yourself, your best friend, or your mom, feel free. If you'd like to use them for teaching, please contact me first. Here are some considerations: If you're using Japanese beads, you'll get a different result than when you use Czech beads because of the relative difference in the bead sizes. There are workarounds, but your first ornament may not be what you expect. Not to worry! Use one of the tips I'll put at the end for finishing it, and give it as a gift! Nobody has to know that you didn't plan it that way! These directions were written based on using Japanese beads. Specifically, Japanese silver-lined beads. If you're using Czech beads, you may want to adjust the "formula" a bit. The basic formula is to have an even number of accent beads going around the top and an odd number of sets of main color beads going down the first row. The circle of beads you make in the first step will be considered the top. To glue, or not to glue? Well, this piece shouldn't get a lot of wear and tear, but you do a bit of tugging along the way. Securing your knots with a tiny bit of clear nail polish or Hypo Cement is a good idea--just don't get any on the ornament when you're embellishing! Wax or Thread Heaven? Again, this is a matter or personal preference. The netting can tend to loosen--you want to keep it snugged up (but not too tight). For some, using bees wax will give the threads a little "grip." Changing threads? Try to add thread in the middle of a group of five main color beads. You don't want knots right next to your accent beads, especially if you need to go through them to embellish (that's another reason for the thinner thread). I use a variation on the weaver's knot taught to me by Carla Abler, a beader in the Upper Midwest Bead Society. Basically, you tie a slip knot in the end of your new thread. When you have 4" to 6" left on your working thread, put it through the slip knot. Make sure the netting is tightened, then make sure the slip knot is close to the last bead. This is a three-handed operation, but I manage by dangling my beadwork from my teeth (shhhh! don't tell my dentist!). Take an end of the new thread in each hand and pull your hands away from each other sharply. You should here an audible click as the knot locks in place. Test the knot by tugging. If you've done it right, it'll stay in place. If not, pull it off and try again. Bead for a little while, then come back and work those ends in an inch or so before clipping close to a bead. Or, use the "thread-addition" method that works best for you. Whew! It's not as hard as all that, really! Are you ready? Let's do it! So far, people were interested in this page!